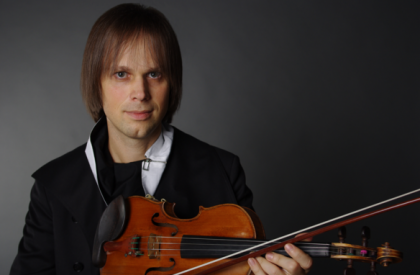 Ukraine-born violinist Dima Tkachenko graduated from the National Music Academy of Ukraine (former Kyiv Conservatoire) studying under Bogodar Kotorovych and Jaroslava Rivniak. In 1998 he was invited to study at the Guildhall School of Music and Drama under Yfrah Neaman. In 2002 Dima was made a Fellow of the Guildhall School and until 2008 was working with Krzysztof Smietana and David Takeno. Dima Tkachenko was awarded the Guildhall School Concert Recital Diploma (Premier Prix) and was a prize-winner at several international violin competitions including the Carl Nielsen Competition (Odense, Denmark), the Lysenko Competition (Kyiv, Ukraine) and the Wronski Solo Violin Competition (Warsaw, Poland). He has toured extensively throughout Europe, Asia and the Americas and has been broadcast on Ukrainian Radio and TV, ORT and Kultura Russian TV, Danish Radio, Polish Radio and TV and on BBC Radio 3 in the UK. His recent performances include appearances with the MAV Symphony Orchestra in Budapest, the Russian Radio and TV Symphony Orchestra in Moscow (with live broadcast on Russian TV), the National Symphony Orchestra of Ukraine, the Bilkent Symphony Orchestra in Ankara (Turkey) within the Ankara Music Festival, the Royal Philharmonic Orchestra in London, the Cracow Philharmonic, the Symphony Orchestra of Chile in Santiago, the Athens State Orchestra, tours in Spain and Germany, also recitals in the UK, Ukraine, Japan, Lithuania (within the Vilnius Festival) and Poland. Dima Tkachenko presently teaches at the National Music Academy of Ukraine, gives masterclasses (the recent ones in Japan, Korea, China, Turkey and Lithuania), goes on jury to several international competitions and is the co-founder and Artistic Director of the Benjamin Britten International Music Competitions in London.